This very special Necklace and Earring Set is the perfect compliment for any occasion. For that graduate...the world is yours... "Reach for the Stars"!! Or these beautiful Pearls and Crystal Stars would look exquisite on any wedding day. 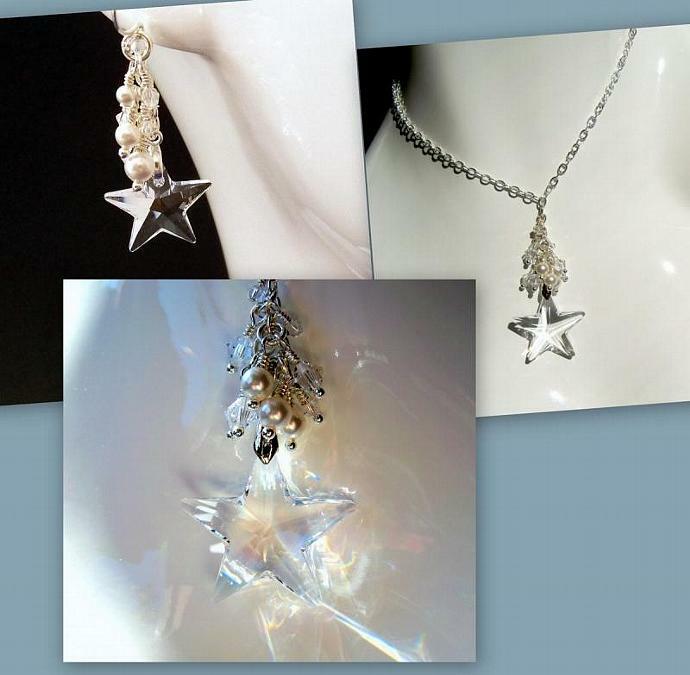 The focal crystal of the necklace is a 28mm Swarovski Strass Star Crystal which bears the Strass logo. Topping this exquisite necklace is a cascade of 3mm and 5mm Swarovski Glass Pearls in White along with 3mm and 5mm Swarovski Bicone Crystals. These have been strung on a Silver-plated round head pin. The Swarovski Strass Star is attached with a Silver-plated pinch bail strung on an 18" Silver-plated Flat Oval Cable Chain. 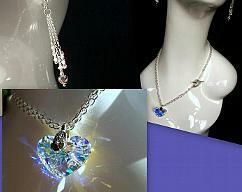 The drop with the Star crystal and the cascade measures 2 1/4". The clasp is a TierraCast Antique Silver Vine Hook & Eye Set. The earrings are Sterling Silver Small C-Shaped Earwires. 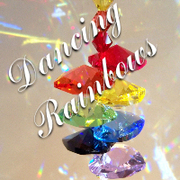 They each hold a 20mm Swarovski Star Crystal. The Star crystals are held by a Silver-plated pinch bail and topped with a cascade of 3,4 and 5mm Swarovski Glass Pearls in White along with 3mm and 5mm Swarovski Crystal Bicones and Rounds. These have been strung on a Silver-plated round head pin. The cascade is attached to the earwire with a small section of the same chain used in the necklace. The drop on these earrings is 1 1/2". Please note that if this jewelry set is continuously exposed to air, the Silver and Silver-plated components may eventually tarnish. I will include an Anti-Tarnish strip with the set. However, I recommend that it is kept in an airtight container.